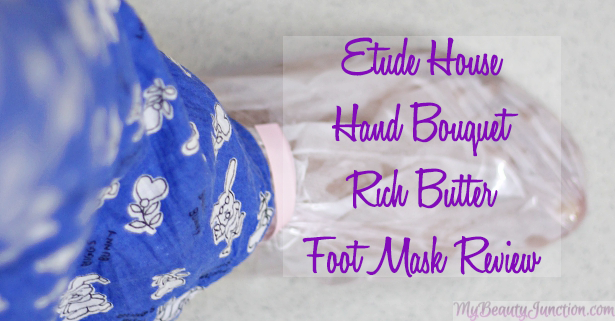 Etude House Hand Bouquet Rich Butter Foot Mask gives you an overnight pedicure. My feet feel really warm at night and I get up to reapply foot cream several times to cool them down. The constant application of foot creams keeps ruining my bedsheets. I love how innovative Korean cosmetics are, particularly their skincare. They have mess-free, convenient sheet masks for everything - face, neck, chin, feet, hands, nails, hair and whatnot. The ones for the feet go on like socks and contain hydrating lotion. These foot masks are now an integral part of my regimen - I cannot recommend them enough. The Etude House "Hand Bouquet" range comprises a foot mask, a hand mask, hand cream and heel cream. The products in this range contain shea butter and a mix of fragrant essential oils and hydrating emollients. Here is my review of the Etude House Hand Bouquet Rich Butter Foot Mask. The Etude House Hand Bouquet Rich Butter Foot Mask comes in basic sheet mask packaging. There are two separate pouches in the pack. The Etude House foot masks are paraben-free and contain shea butter, peppermint, pine leaf, jojoba, prune, camellia and lemon extracts. Once the socks are in place, the serum sinks into the skin and cools my feet down. The instructions say I should leave the mask on for 15 minutes, but I usually keep them on overnight, and my feet do not resemble wrinkled prunes in the morning, but are very soft and glowing and callus-free. Just the one mask will take care of dry feet and rough skin. Best of all, these masks do not stain the bedsheets because of the plastic footsies. The masks are quite comfy to wear and to sleep in. I now use a pack twice a week and can go on for a few weeks without a pedicure. Nor do I have to wake up to reapply foot cream. These masks are just $4.98 each and you can get them from Jolse.com - they ship worldwide free or for $2.50 tracked - free tracking for orders above $40 - and send out samples and freebies with every order. I recommend a lifetime supply of these!